Some gravity filter batteries can operate with a variable flow rate, without individual control and without significant level changes (figure 23). In this case, filters are supplied with settled water from the same pipeline or the same channel, without a fall, since no distribution is required. The filtered water flows into individual basins where the weir (9) is set so that the filter bed remains covered when the filters are shut down or only operate at a low flow rate. Each filter outlet is equipped with a shut-off valve (7), backed up by a valve (8) that creates an additional head loss. The raw water feed (1) is adjusted according to the level in the treated water tank (11) by means of a level sensor (12) and a general controller (13). the head loss suffered by the filter before it is washed must be such that, when reduced to its value for an average filtration rate, it reaches the customary values of 1.75 to 2 metres. These two conditions set both the secondary head loss p and the geometric drop that can be expected through the filters. According to the diagram in figure 26, the raw water flow rate is modulated according to the level in the tank and this generates a variable level over the filters. 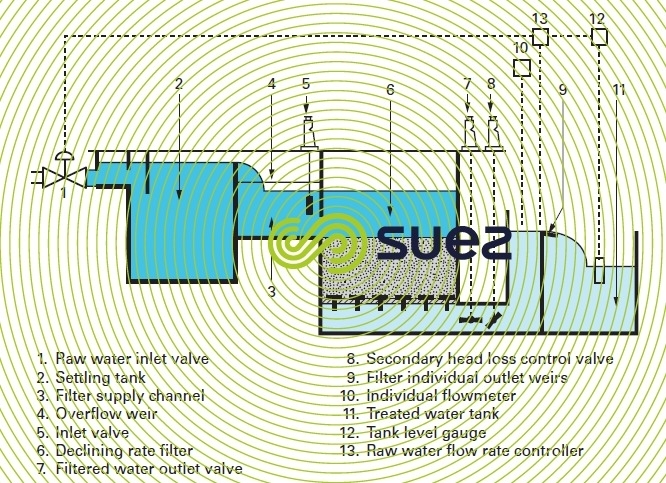 The operation of declining rate filters requires a knowledge of the individual output of each filter; this output can be measured applying the same scheme, using the water height at the weir (9) or a head loss through a narrowed section (valve …). the quality of the water to be filtered degenerates suddenly; in this case, the level in the clarified water launder rises fast. This creates major risks of discharging through the overflow (4).